SAN MATEO (July 24, 2013) – Duck Duck Moose, award-winning creator of educational mobile apps for children, announced today the appointment of Alan Shusterman as Chief Executive Officer and a member of the Board of Directors effective immediately. Alan brings more than 20 years of experience developing, building and managing profitable start-ups and businesses including Edusoft, LinkExchange, Inc. and Jobnob, Inc. Through various endeavors, Alan has gained impressive business management, online product development and team leadership experience. As an early investor and Vice President of Client Services at Edusoft, an assessment management tool used by school districts to manage students’ performance, Alan was instrumental in helping more than one hundred California school districts re-tool their education practices and assisting teachers with curriculum development. In two years, Alan helped grow the business by 20x, leading to a purchase by Houghton Mifflin Corp. His experience collaborating with teachers, principals and superintendents complements the educational mission of Duck Duck Moose. As a founding member, Alan led LinkExchange to become a full-scale online marketing solution provider and a pioneer in web advertising and search, email and affiliate marketing. He helped grow the company to more than 100 employees and executed a sale to Microsoft for $265M. 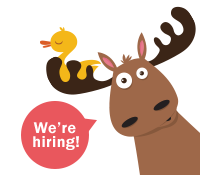 In just five years, Duck Duck Moose has established itself as a leader in the children’s educational mobile app industry. With 16 educational titles ranging from classic nursery rhymes like Wheels on the Bus and Itsy Bitsy Spider to creative-play apps such as Draw & Tell and Trucks to early learning and curriculum-based games like Park Math and Duck Duck Moose Reading, Duck Duck Moose has achieved millions of paid downloads and has won more than 30 industry awards. In September 2012, the Company received $7M in its first round of Series A funding from two leading Silicon Valley venture capital firms, Sequoia Capital and Lightspeed Venture Partners. To date, the company has 20 full-time employees in the U.S. and a team of four engineers based in Shanghai. Duck Duck Moose will release its 17th app for iOS in August and is focused on expanding its offerings to the Android market. Co-Founders, Caroline Hu Flexer and Michael Flexer will work alongside Alan and remain involved in the day-to-day business and operations of Duck Duck Moose. Caroline will continue leading the Product Management team as Chief Product Officer and Michael will maintain his role as Chief Technology Officer leading the U.S. and Shanghai-based engineering efforts.